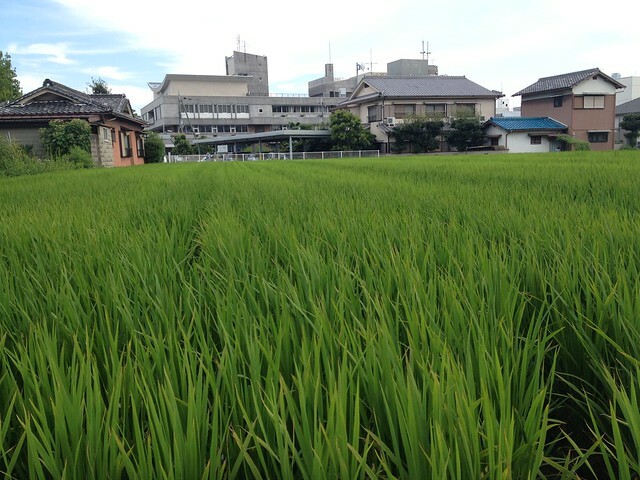 Our suburb of Minoh is full of rice paddies and gardens. You can find them scattered between residential and business districts. Often there are several fields together. 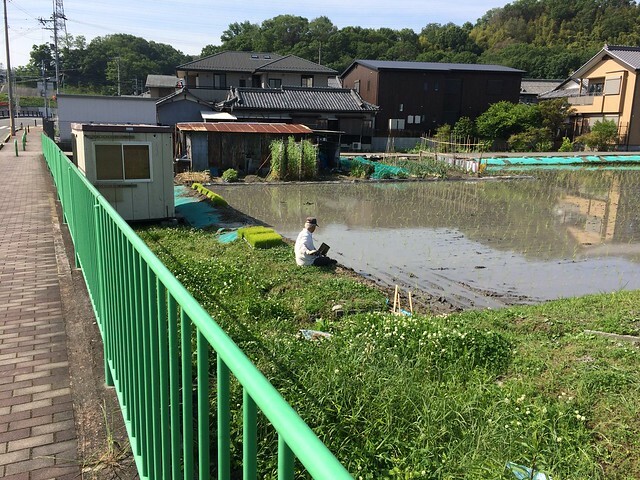 The method of rice cultivation here requires standing water and so coming from the hills of the Minoh quasi national park down into the city, there is a system of irrigation canals and reservoirs for capturing rainwater and storing and directing it towards the fields. The field above, as you can see in the another photo below of the field, has an reservoir right next to it. The reservoirs are a great place to see and hear wildlife. I’ve taken many photographs of ducks and herons. There are canals everywhere, mostly on the sides of roads. In a safety conscious country like Japan, this is unexpected because they are easy to fall into on a bicycle or car. The rice paddies are mostly tended to by older people, which there are a lot of in Japan. The government subsidizes the production of rice in the name of national culture. Small, private farms are not economical, but it is nice to see agriculture everyday and the Japanese practicing this facet of their culture. I wonder if the younger generation will continue this practice? I also would like to know how much the government spends on this. 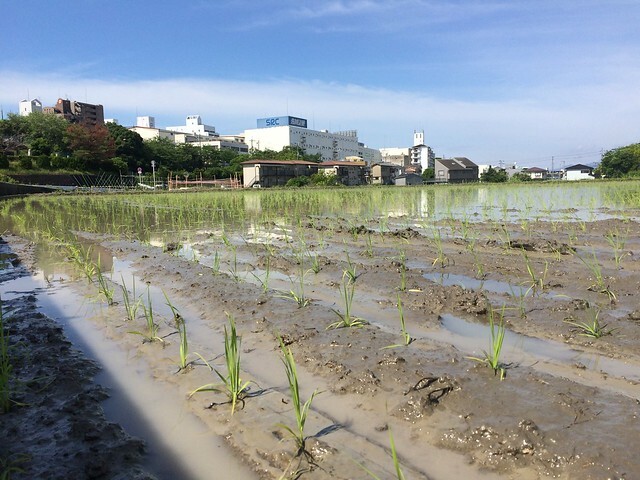 The last week in May and first week in June is when rice if first planted. The seedlings are started indoors and then brought out to the fields. You can see the seedlings in the photo above, they are next to the man. Most of the planting I saw was by a machine that looked a little bigger than a riding lawnmower. The Minoh city office organized a community planting for families and they did it by hand. The fields are then flooded and farmers watch to make sure the water levels remain static. 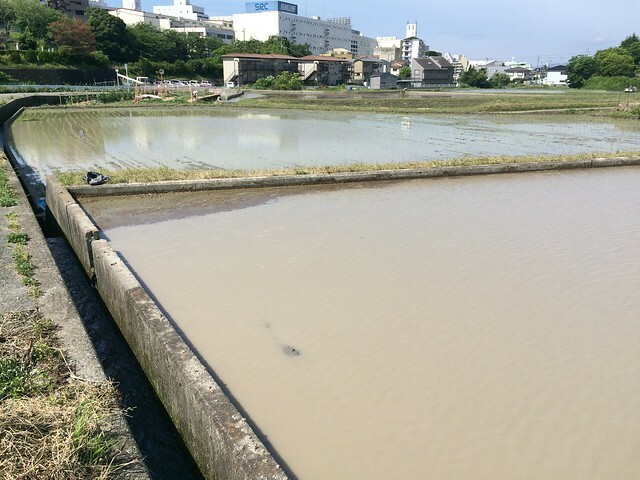 The water blocks out other weeds from outcompeting the rice. When I get back from summer holiday and August, the rice will look as it does below. The rice is harvested in mid to late September and I hope to participate in a harvest this year. It would be interesting to see how it goes from field to the store. I have no idea.